I have provided some instructions on how to make your own version of the game. There are two sections so far. 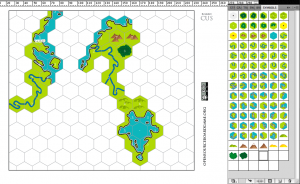 Build your own units and a custom map maker. See below for instructions and files for each. You can see here where the six unit properties can be found on the playing pieces. The recipe for these is very simple because the values rely on each other. Defence: Same as attack values, except that the value should be one more than the same fast moving attack unit in that tier. To clarify this Pikeman has a defence value of two and a horseman has a attack value of one. Move: number of tiles a unit can move, this value needs to be low at the beginning so as to make early attacks difficult, and higher later in the game to encourage player interaction. Units with limitations, such as ships should have higher move rates to add value. Cost: For regular land units the sum is (Attack + Defence + Move +1)/2. For slightly limited units such as settlers (Attack + Defence + Move -1)/2. For severely limited units such as ships which can only move in certain hexes (Attack + Defence + Move -2)/2. Transport: This value can anything below 7 but I recommend it increases slowly with time. Range: This value can anything below 6 but I recommend it increases slowly with time. Range units should generally be slow moving. 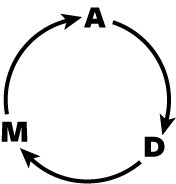 The image here shows the strengths and weaknesses of each military unit value A (attack), D (defence), M (move). Careful use of these values in custom units will maintain balance in the game. There are number of values to consider but it is important that units should not be strong in too many values. 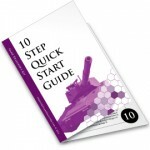 Ideally units should be strong in only one of these three values: attack, defence or move. I have tried to make move values of strong defending units and range/high attack value units inline, so that those units share the same tier. Fast moving units of that tier should general be lower in both attack and defence than the other units of that tier. Each value has it’s strengths and weaknesses. Moving fast has the advantage against strong attack units because they can attack first using their speed, but are weak against strong defence they generally do not need to move. Strong attack units are strong against defence especially when mixed with other units as they generally have range. Defending units complete the circle, strong against fast units and weak against strong attack with range. The cost of units uses the formulas mentioned above, and they seem to work fairly well, but feel free to experiment. The transport and range values should be limited, but transport has limited usefulness with large land masses, and range is purely a utilitarian value. I have provided a map template for players to design their own maps. There are however some limitations. One issue is that I use Illustrator to design my maps and the way I have designed the map editor requires the use of Illustrator and the Symbols window. The benefit for those with Illustrator is it becomes a simple drag and drop affair. so it is very quick to create a map. The down side is Adobe Illustrator is a licensed product, however you could download a trial version to build your map. If you’d like to use it to make maps for your own games feel free to download, but I would appreciate the acknowledgement as per the CC license. This is from a recent post: The board should be balanced in way that strong defensive locations are either low on resources or expensive to build on. While you don’t want a completely balanced board, and it would never happen unless every tile was the same, you want to make sure that the advantages of a location are equaled by the disadvantages. The main reason you don’t want a perfectly balanced board is you need the variation, this allows players to take different approaches to playing the game dependent on where they are. I have tried to keep it as simple as possible for players to make their maps. Download the Custom Map Files. There are two files a pdf for using with other vector programs and an AI CS5 file for using with Illustrator. I have not tested this file with other programs so it may not work as expected. 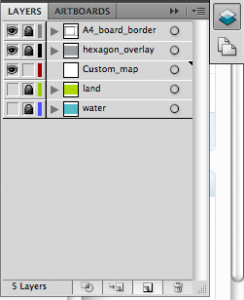 If the layers panel is not open you can open this panel through the menu Windows->Layers, or click F7 or there may be a tool bar Icon that you can click to open this up (it looks like two overlapping squares. 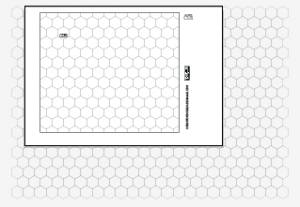 If the A4 board border layer and hexagon overlay are not visible click the space to the left of the lock. This will add an eye to that layer and make it visible on the stage. You can switch layers on and off by clicking on this eye. You will also need to remember that the lock will prevent you from editing that layer. Leave the locks on for now and click the layer that says Custom map (click where the word is), make sure this layer is not locked. The work area or stage should look like this. The two layers of the border and grid will show on top of the tiles you are about to lay down. Layers appear in the order they are in the layers panel, so the layer on the top will appear on the top of all the other layers. With the custom map layer selected open the symbols panel. Use the menu Windows->Symbols, or press the clover symbol in the tool bar. This will open up a new panel with many hexagon map icons in it. 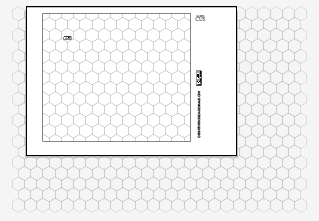 From this panel drag symbols onto the stage, trying to match them up with the hexagon grid. If you misplace one of the tiles you can use the arrow keys to move it left or right until it looks like it is correctly aligned with the grid. NB: You can use the black arrow tool to move, select and place symbols. After placing some symbols your map should start to look something like my example. There are many symbols to select from and I have tried to provide a variety of options so you can build almost any map. There is one extra feature in the layers. If you are planning to do a mostly land map switch the land layer on by clicking in the space to the left of the lock. 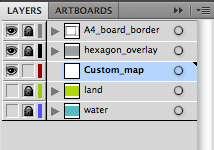 If you are planning to make a mostly sea map, click this layer instead. this will place all green or blue behind the grid and save you having to lay those tiles down individually. You placed tiles will appear on top of these layers. Good luck and happy map building. 🙂 Feel free to email your maps to me and I will gladly test them out.